The Civil War-era mansion known as the Cary House is private property, but it has a legend attached. The daughter who lived here had two beaus on opposing sides of the war, and they happened to kill each other on the staircase. Rumor has it that on Mr. and Mrs. Cary’s wedding anniversary, you can hear the phantom sounds of clinking glasses, laughter and voices. 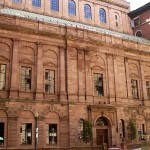 I was born and raised in Cambridge Ma and frequented the public library next to Camb Rindge and Latin high school. This was 1966 to 1970. I am a little sensitive to the spirit world and always got nervous and uncomfotable going into the “stacks” area. I had a friend who worked at the library and asked her if she ever got a spooky feeling going in there. She said no and looked at me like I was weird. Has anybody experienced this or seen anything at the library? The ONLY paranormal experience I’ve EVER had was in an apartment my family rented years ago on Forsythe Street in Chelsea Ma. Almost every night I would hear a key unlock the front door, the door open and close but no one was ever there! I heard my name being called outloud. I answered because I thought it was my sister and NO ONE was there! I was 18 at the time. I never said anything about it until one night about 6 months after being there, we all sat down for dinner where my step father brought up different things that he had been hearing and didn’t want to say anything because he didn’t want to scare us. One of the things he was hearing was the key opening up the door, the door opening and closing, my sister and mother had been hearing it to and my mmother heard her name being called as well. I thought it was strange that no one spoke about it until that night. We didn’t stay there much longer. When I’m asked about any experiences I’ve ever had, I always tell that story. I’ve always wondered about that place. I can’t remember the number of the apartment but def remember the street name. Forsythe St. Anybody know about anything ever happening there? Was that 10 forsyth st.? It would be great if i knew cos i live there.